I’ve never been into the idea of having a signature scent. Twenty seconds into trying on my first perfume (the classic, spicy Paloma Piccaso), I got bored and proceeded to add a few generous spritzes of Bath & Body Works Cucumber Melon. While this is an appalling scent combination I could never in good conscience recommend to anyone, it set the tone for the rest of my relationship with fragrance. I wear something different almost every day, flitting between bottles as often as my mood changes (aided largely by magazine testers, blogger swaps, and free samples from department stores). A signature scent that accurately reflects my inner emotional landscape and vision board at all times—this is something I cannot fathom. Among the hundreds that I’ve sampled, there are a handful that stand out to me, and they’re all from an incredibly chic brand called Maison Francis Kurkdjian. Kurkdjian has been behind plenty of the bottles you probably already know, from brands like Jean Paul Gaultier, Elie Saab, and Burberry. And for his own line, he creates masterpieces that are incredibly evocative and beautiful, the kind of scent that will unfailingly make every day feel special. My personal poison is the $215 Grand Soir, a vanilla so well-rounded and robust that I can practically chew on it. There’s benzoin and rose honey in there, plus incense absolute, ylang ylang, cumin, atlas cedar, and sandalwood. It’s a golden blanket of spices and sweetness and warmth and just smells so expensive and cozy that I occasionally even spray it on my pajamas. It might not be the only one for me, but it’s the only one I couldn’t imagine giving up. Unfortunately, I didn’t have to imagine it—because I got to experience saying a tearful goodbye to it firsthand. When I moved to Berlin from New York, I had to relinquish my precious bottle (along with most of my worldly possessions) at JFK, an incident I’m still trying my best to erase from my memory. Long story short, when I landed in Germany to start my new life, I also did it without the comforting presence of Grand Soir at my side. For a while, I convinced myself it was fine, that I would move on from missing an inanimate object and live my life like a normal person. But it didn’t take long for me to start craving its radiance. Things just felt a little colder without it. Knowing that I wouldn’t be able to find an exact dupe, I ventured into the aisles of my local Dm-drogerie Markt (Germany’s version of a CVS) with an open mind and a handful of change. The thing about vanilla is that it can be surprisingly hard to do well, and poorly formulated vanilla perfumes smell like a migraine-inducing mix between Funfetti household cleaner and plastic cupcake frosting. This is why I immediately decided against body sprays and moved on to the bath and body section. And there I found it: Dove Bodylotion Intensive Pflege (or Dove Cream Oil Intensive Body Lotion, as it’s called in the U.S.), for a mere 2.45€. Please note that I am not suggesting this smells the same as Grand Soir; I would have bought out the entire drugstore if that were the case. But many body lotions and shower gels have such mild scents that they almost melt into you, creating a smell that’s one part fragrance and one part clean skin. Although they’ll cost you far less than a mass-market perfume, they can wind up smelling more expensive—and a whole lot subtler—if you find the right one. And this Dove discovery, it’s perfect—a little sweet, comfortingly warm, kind of reminiscent of clean laundry, and not harshly sugary or shrill in any way. I use it right out of the shower, sometimes dabbing an extra layer over my pulse points, and feel instantly more cheerful. As an added bonus, it does a good job of deeply moisturizing with its oil-cream formula (because, you know, that’s what it’s actually supposed to do). While I’ve been informed that the brand is phasing out its body lotions Stateside (stock up while you still can! ), its equally palatably priced Dove Shower Foam in Shea Butter and Warm Vanilla is also fantastic. When the airy lather rinses off, you’re left with the mildest hint of something sweet and soothing. 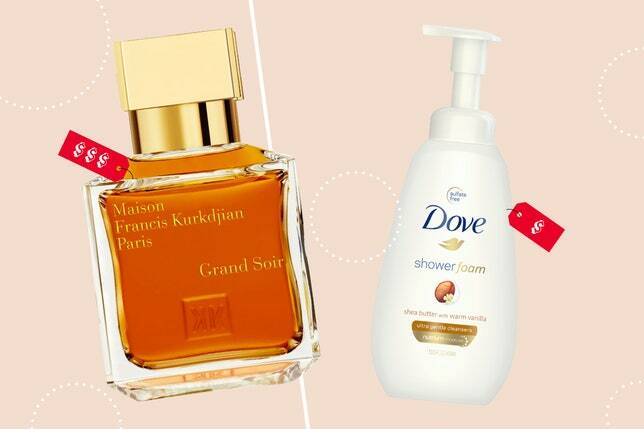 It’s $6, you have to shower anyway, and you can start saving up for a bottle of Grand Soir this way. I know I am.